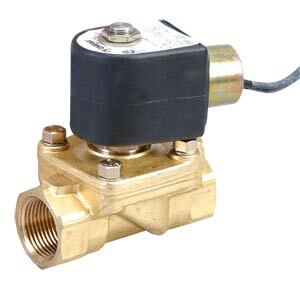 Follow this link if you want to know how a solenoid valve works. The SV230 Series valves are designed for low-pressure steam applications in which the valve must operate when the pressure drop across the valve falls into the 0 to 5 psi range. These valves are able to control steam up to 45 psi at 143ºC (290ºF). All seals are made of ethylene propylene for compatibility with steam over a wide temperature range and for trouble-free, bubble-tight service. The SV231 through SV235 are direct-lift valves, which combine the features of a direct-acting valve with those of a pilotoperated valve. Because of a flexible link between the solenoid plunger and the diaphragm, the direct-lift valve functions as a direct-acting valve at low pressures and as a pilot-operated valve at high pressures. It is sometimes referred to as a zero delta pressure valve or a hung diaphragm valve.